The new iPhone for 2018 is going to be released in this month and there are lots of news about it, including its release data, possible name, design, price, features and so on. All these news can give us a general idea about the coming product. So if you are an iFans or the one wish to buy the new iPhone, you need to know something about the new iPhone in advance. Here is a complete introduction for you. Part 1. When is the Release Date of the New iPhone for 2018? Part 2. How Many Models Will be Released & What Will They be Called? When is the Release Date of the New iPhone for 2018? According to the table, we can see that Apple has announced every new iPhone in the first or second Tuesday or Wednesday of September. In addition, French radio station Europe 1, citing two unnamed sources, claims that Apple's annual iPhone event will be held on September 12 at Steve Jobs Theater. So we can speculate that the new iPhone will be released in 12 September, 2018. On that day, you can watch the live stream at apple.com. How Many Models Will be Released & What Will They be Called? Last year, Apple has launched three models - iPhone 8, iPhone 8 Plus and iPhone X. So this year, it is expected to repeat that feat with a trio of totally new models. And according to the tradition of Apple, these three new models are very likely to be named iPhone XS, iPhone XS Max and iPhone XR. In line with the news, these products equip some new as well as useful functions, so we can look forward to the surprises they will bring. Now let's see the design and new features of the new iPhone! The most popular news says that Apple will launch 3 new models with different sizes - 6.5 inch, 6.1 inch and 5.8 inch. Apart from the size, the displays of these devices are also disparate. It is said that the 6.5-inch and 5.8-inch iPhone may equip the OLED display while the 6.1-inch device would equip the LCD display. People also expect all new iPhone for 2018 to adopt the all-screen iPhone X design, which means a bezel-free design and no Home button. This design enables users to enjoy a large screen while watching movies or playing games. No border will limit the presentation of the screen. It is said that all these new phones will offer wireless charging like iPhone X. So here we can guess that all the new devices will have glass backs, which will give a better experience to their users and let them enjoy the advanced technology - wireless charging. Another great change of the new iPhone would be the dual SIM design. That is to say, the new mobile phone will allow users to insert two SIM cards into their devices and use two cards on one device without restrictions. However, these three devices would only support the nano-SIM and eSIM presently. It is not compatible with the existing micro-SIM cards. 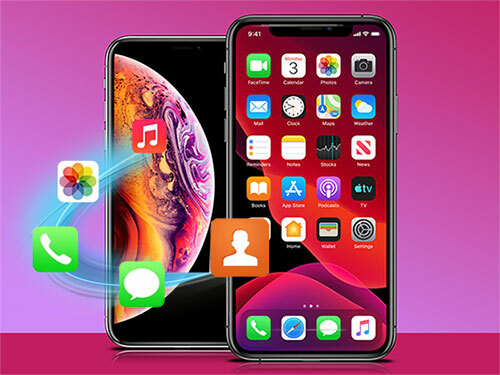 There is no doubt that the new iPhone also equips some other useful features, such as the Face ID, PVD color process, wireless charging, video recording, front-facing "TrueDepth" 3D camera, larger and deeper pixels, video playback, audio playback and so on. Apart from that, some features of iOS 12 are also available on these new devices. - The 6.1-inch LCD model - "iPhone XR" might be $749. - Pick up a powerful mobile transfer tool for transferring data to new iPhone. For majority of users, making a backup for iPhone or Android phone is an easy task. But do you know how to transfer files from old iPhone/Android to a new iPhone? In this case, you need a professional phone to phone transfer tool called MobiKin Transfer for Mobile. This program enables you to transfer data from Android/iPhone to iPhone/Android with simple clicks. And during the transfer, no any data will be damaged or lost so you can use it with an easy mind. You can download the trial version of this software on your computer to have a try. Step 2. Just connect your two mobile phones to computer with two USB cables and then go with the prompts to let them be recognized. Step 3. Now you will see the connected devices and the transferable files are displayed on the program. Just check whether your new iPhone is the destination device. If not, you need to tap on "Flip" button to change its position. Step 4. At last, you can tick off the folders that you want to copy to the new device and hit the "Start Copy" button at the middle to begin the transfer. Do you have a general idea about the new iPhone now? Do you like the new devices? Or do you have some other different news about the new models? Just fell free to share your opinions with us. iMessage Not Working in iOS 11, How to Fix It?